I forgot to post about this year’s Halloween costumes, probably because I didn’t make anything new. Thing 1, Thing 2, and I stuck with our Pokémon Go costumes from ComicCon, because I’ll be darned if I put in all that work for us only to wear the costumes once. That’s the deal that I made with my girls when I started making them Con costumes: their costumes have to be based on something that they like well enough to want to wear again almost half a year later. So given that the majority of Halloween activities happen after dark, the best photos of their costumes were taken back in May. Photo by Richard Dufault Photography. 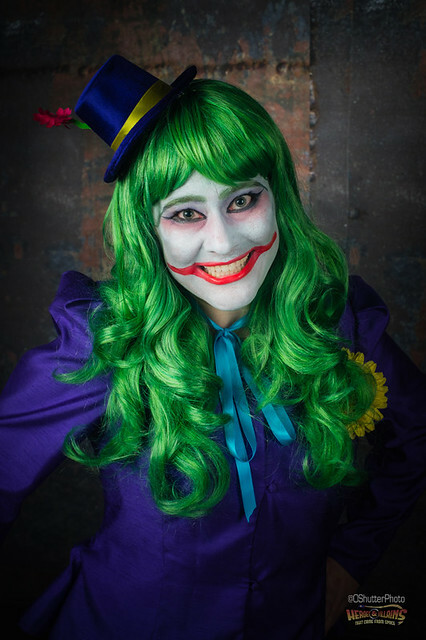 For Heroes & Villains, which is an annual geeky Halloween party around here, I reused my Femme Joker costume. I added a hat (which is really more purple than blue), a cane, and I took the makeup from almost-jolly Cesar-Romero-like paint, to something a little more sinister, not quite Heath-Ledger-like but closer. I think I am almost done the Halloween party leftovers, too, except for the cookies. 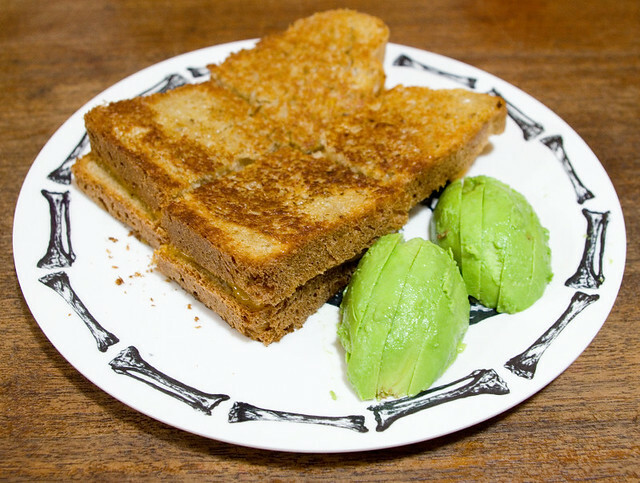 Last night I made grilled cheese for the family dinner, using Light Rye and Caraway Bread (page 75 of Bread Machine: How to Prepare and Bake the Perfect Loaf by Jennie Shapter (2002)) and old Balderson cheddar, with a side of sliced avocado. 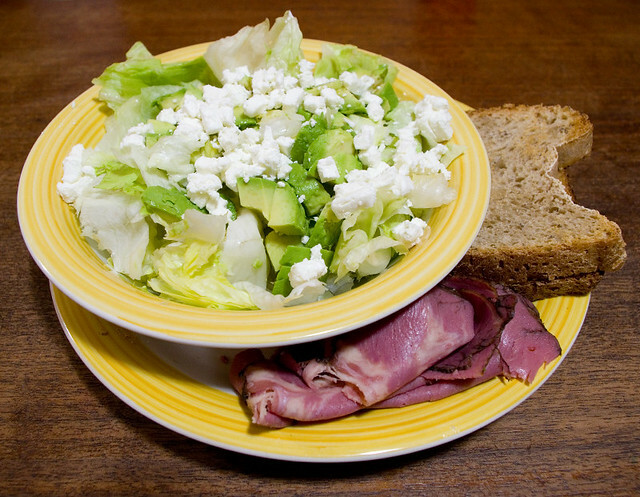 For me, since I can’t have the cheese, I made toast out of the bread, and served it alongside Montreal smoked meat and a salad with iceberg lettuce, avocado, and Woolwich Dairy Soft Unripened Goat Cheese Crumbles. It’s a little bit healthier than what we’ve been eating all week, I think! Now if only I can get the temptation of the mini chocolate bars out of the house, things will soon get back to normal. 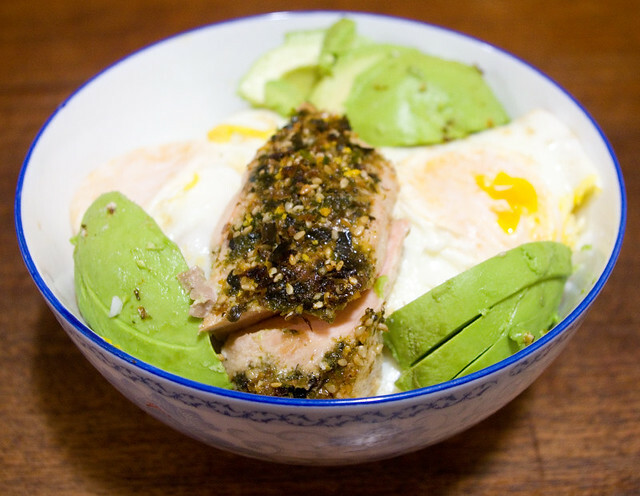 After about a week of junk food and candy, I thought it was about time to start making some healthy food again. I needed (and still need) to use up some leftover food from the Halloween party on the weekend before it goes bad, so dinner planning for the last few days has been centered on that. 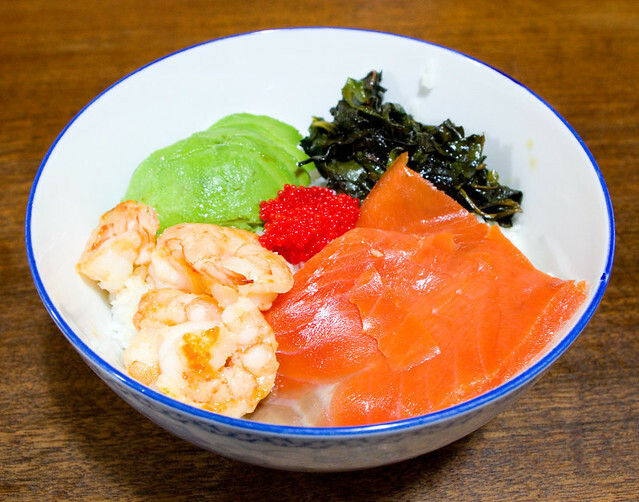 On Monday night I improvised some sushi bowls, which contained garlic shrimp (from my freezer), smoked salmon (leftover), lumpfish caviar (which I had meant to put on the deviled eggs and then completely forgot about), avocado slices, and steamed Swiss chard (from my garden) in a drizzle of teriyaki sauce. I was looking for a better way to serve Swiss chard that my kids might actually eat, and although this wasn’t horrible, I don’t think it was all that great either. I need to experiment more. Last night’s dinner was French toast and apple slices. 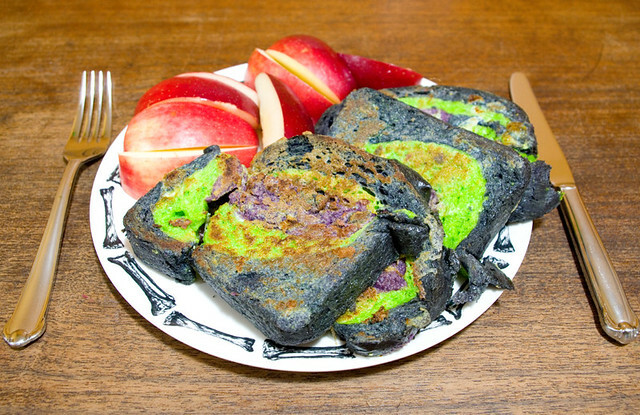 I think that French toast looks absolutely hilarious when it’s made with Voodoo Bread. I mean, it tasted just like normal Nan’s Pan Rolls bread dipped in eggs and fried, but the colours definitely made it much more fun. My kids are really into this “rainbow bread”, as they call it. Perhaps I could make it in different colours for other holidays, even if I can’t quite get it into the proper swirl.